Born 1942 in Scalea, Italy. Lives and works in São Paulo, Brazil. Central to Anna Maria Maiolino’s practice are notions of subjectivity, belonging and place. Maiolino was born in southern Italy and moved to Venezuela in 1954 with her parents where she began her artistic training. In 1960 she moved to Rio de Janeiro where she joined the independent studio run by printmaker Ivan Serpa at the Museum of Modern Art. Maiolino’s work perfected a dialogue with contemporary movements in Brazil at the time, such as new figuration. Given her eclectic background, Maiolino’s works reflect a negotiation of identity. In the mid-1960s, she adopted woodcutting, a typically north-eastern Brazilian technique, as her preferred medium. In 1966 she began to experiment with non-traditional media such as upholstery stuffing, strengthening her connection to new figuration. 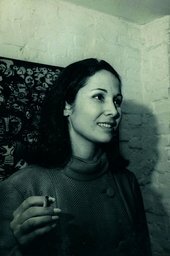 In 1967 Maiolino participated in the landmark exhibition New Brazilian Objectivity alongside Helio Oiticica, Rubens Gerschman, Raymundo Colares, Antonio Dias and others, cementing her place in the Brazilian art scene. Anna Maria Maiolino’s iconic work Glu Glu Glu 1966 presents an open-mouthed, red-lipped dismembered female figure, with its digestive apparatus in view. This work reflects her concern about the effects of mass culture on the realm of domesticity and the subjectivity of women. The marked division between the upper part of the body, contained within a box, and its organs, strengthens the symbolic disconnection between body and mind. The fragmented figure, with its open, toothy mouth and insides, bears witness to the effects of outmoded consumption on subjectivity, left fragile and exposed. Glu Glu Glu retains the hard-edge aesthetic of Maiolino’s early experiments with woodcutting, a craft that for the artist encapsulated the multiple facets of Brazilian vernacular culture. The colour and garish quality of the work, made of stuffed upholstery, overrides its grotesque subject matter. Its three-dimensionality provides it with ‘flesh’ and Eros, pronouncing an increasing sensitivity towards the notion of the body as commodity. Interview with the artist Anna Maria Maiolino, included in the World Goes Pop exhibition at Tate Modern.